Tim Tebow gained fame as an NFL quarterback who was outspoken about his faith on the field. Now an SEC Network analyst, Tebow is also known for sharing his faith off the field. 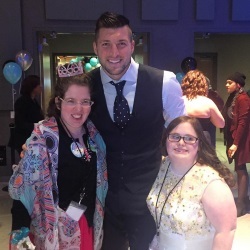 On February 12, the Tim Tebow Foundation sponsored "Night to Shine," an event hosted simultaneously by 200 churches across 48 states and seven countries. Each site held a very special prom night, providing an evening of dancing, dressing up and lots of fun for special needs people 16 and up. The event was a huge success, as thousands of volunteers partnered with the foundation to make the night happen. Tebow had a great time surprising some attendees in New York City by personally showing up at their prom to celebrate with them. "We are so thankful for God's bountiful blessings on #NightToShine last night as the world witnessed His love and more than 70,000 volunteers come together to honor and love more than 32,000 Kings & Queens!" Visit timtebowfoundation.org/index.php/stand-with-night-to-shine to see a collection of photos and videos from events around the world and to learn more about the foundation.